The Sony Ericsson Yendo had no issues with reception and the in-call sound was loud and clear. The device lacks Smart dialing like most of the recent Sony Ericson phones. It does support searching by number, but this is not the smart dialing we hoped for anyway. In the Mix Walkman the call log is a part of the dialer application. 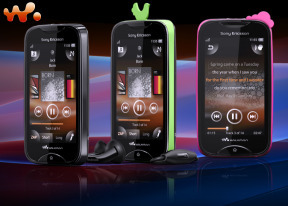 Thanks to the proximity sensor, the Sony Ericsson Mix Walkman automatically disables the touchscreen during a call. We also ran our traditional loudspeaker test on the Sony Ericsson Mix Walkman. The phone scored "Good", meaning you could miss some calls in noisier environments depending on the ringtones you use. You should also know that placing the device down on its back doesn't seem to muffle the sound – it gets amplified instead. More info on the test, as well as other results can be found here. The SMS and MMS section is quite straightforward. When you add multimedia content to the message, it is automatically turned into an MMS. The Mix Walkman’s email client supports both POP and IMAP inboxes, but we had to configure manually. This only took us a few moments though. The Email app interface is simple and thumbable. On a screen this small, the lack of a virtual QWERTY keyboard shouldn’t be a surprise. All you get is an alphanumerical keypad, even in landscape. The gallery interface is a plain grid with the images sorted by date. The app supports up to five megapixel shots. Since the phone has a built-in accelerometer the screen orientation does switch automatically when you rotate the device. Pinch-zooming isn’t available but Sony Ericsson have come up with their own version of one-finger zoom that actually works fine. You just hold your finger down and then sweep upwards to zoom in or down to zoom out. It works but it could’ve been quicker and way more responsive. With the Mix Walkman sending pics via Bluetooth is easy. You can also send images over email or MMS.